Sixty pupils from seven elementary schools in Minhang District were given a mini soccer training at Huahong Elementary School on Friday afternoon by two coaches from BVB. Sixty pupils from seven elementary schools in Minhang District were given a mini soccer training at Huahong Elementary School on Friday afternoon by two coaches from BVB, the famous football club in Dortmund, Germany. This event, held by BVB Evonik Soccer School, is part of the "Kickoff" Football Project Shanghai which aims to help children of migrant workers in the city take part in sports activities. The project, which is a charity program run by Shanghai Charity Foundation's United Way Fund, now covers 13 elementary schools in Minhang District and Pudong and has benefited about 2,000 children, according to the fund. 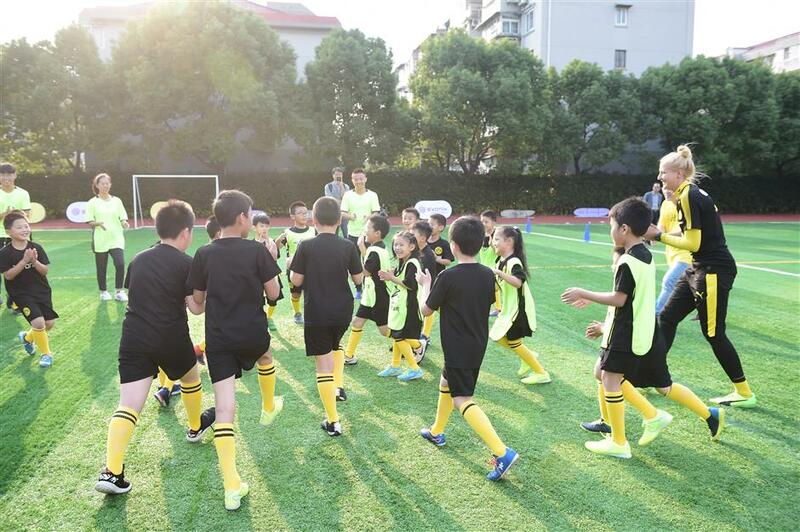 Under the project, professional German football coaches give weekly football classes to the children and also help train sports majors at Shanghai's universities and PE teachers at elementary schools. The project's German partners in Shanghai also include the German Consulate General and the German Chamber of Commerce.